Alister McGrath is an Anglican who writes often on Reformation theology and related issues. 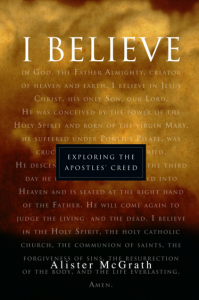 This is a small book that reads like a primer on the Christian faith using the Apostle’s Creed as an outline. It is loaded with good illustrations about basic doctrines as well as simple explanations of the meaning of biblical words such as justification, forgiveness, reconciliation, glorification. At times the book reads as a calendar for Anglican church life, but beyond that it is very thoughtful and helpful.